The rapper's emergence on Twitter this week revealed some eye-opening facts. These are our favorites. Is social media big enough to contain Kanye West? He’s long been blogging, but this week the Grammy-winning rapper favored Facebook with an impromptu a cappella performance, then joined Twitter and added 300,000 followers in just three days.That’s a lot — and he noticed. While Kanye sometimes uses Twitter for news — revealing an album title change, or new lyrics — he mostly showcases his fabulous life. And it’s pretty, pretty fabulous. No. 5: Kanye West makes extravagant purchases — then does stupid things with them. Tweet: Is the Versace sofa to[o] hood? Might need to cover it in plastic!!! No. 4: Kanye West drinks from golden goblets, instead of water bottles. Tweet: I hate half empty water bottles so I copped these #goblets to drink out of. No. 3: Kanye West is on a horse. And is a king. Tweet: I need this horse… Kings need horses. No. 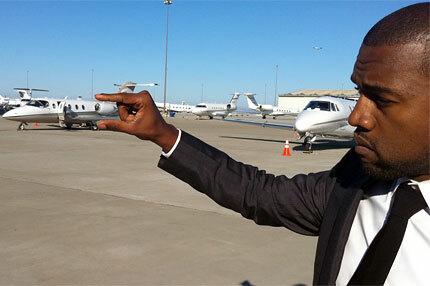 2: Kanye West won’t settle for private jets that aren’t bigger than a baby mama’s. Tweet: I’m bout to hop on this #BABYMAMAJET the jets Billionaires give to they baby mamas or they 1st 2nd or 3rd wife / Man this jet small as hell Don C!!!! No. 1: Kanye West has cooler friends than you, and will rub that in your face (while creating new adjectives no less). Tweet: I wish I had a Twitter when I was at the Lanvin store in Paris 3 weeks ago with Jay & B uuuuugh so many missed stuntastic moments. What’s your favorite Kanye Tweet? Sound off below.